"I’m a kid from the Bronx who knows what it’s like to be a kid from Boston." Growing up in the Bronx, NY, Marcus Walker attended all New York City public schools throughout his life, and attributes his successes in life to the education he received in public schools. His unique pathway to teaching – his first career was as a documentary filmmaker - shows how diverse backgrounds and experiences contribute to the development of effective teachers. In his previous career, Marcus worked for the documentary film company that made Eyes on the Prize, the landmark documentary that vividly captured the tumultuous history of South Boston High School – the building in which he currently teaches. He is amazed at the serendipity that made his career to come full circle, leading him to teach and thrive in a building and community with such a storied past. When not teaching: I am listening to music. Music is my essential refuge. Dinner with anyone: Martin Luther King. It’s not the cliché choice; not enough folks realize how far ahead of his time he was. Favorite restaurant in Boston for unwinding: I have two small boys and Boston has excellent food. Therefore, any place where my wife and I can go without kids that provides plates of food and does my dishes is perfect for unwinding! If I must be specific, Redd’s in Rozzie is totally awesome. 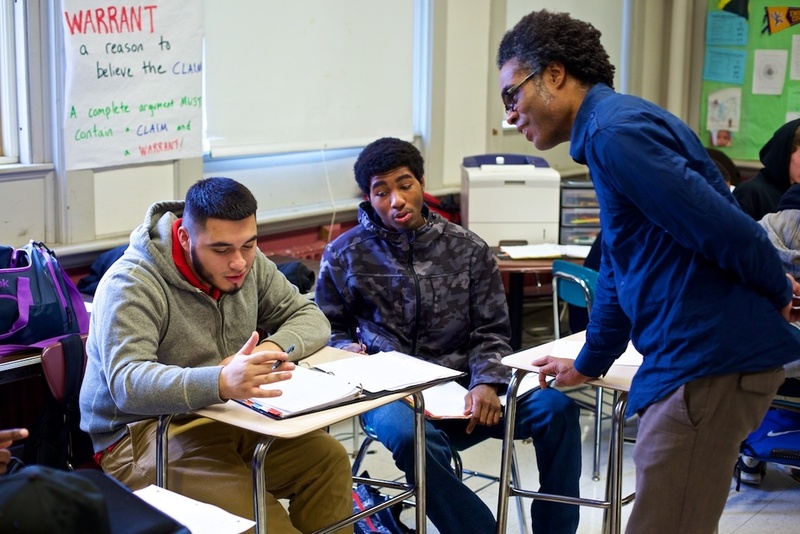 The Boston Public Schools Office of Human Capital sat down with Marcus Walker in fall 2014 to learn more about his experiences in the Boston Public Schools as a community member, teacher, and educator of color. Here's what we learned during our time with Marcus. Why do you teach in Boston? Giving back what was given to me is part of my identity. I was born and raised in the Bronx and attended New York City Public Schools throughout K-11. I’m a kid from the Bronx who knows what it’s like to be a kid from Boston. I was blessed to receive a mostly excellent public education under challenging conditions. I’m trying my best to return this fortune. Teaching in Boston allows me the opportunity to make a difference in the lives of some of our most under-served children. What brings you pride? I’m proud of my senior elective class: African American Music Studies. For nine years – no other elective at Excel has come to last nearly as long – the class has been going strong. The course traces the history of African American music from its roots in West Africa up until present day hip-hop. Creative projects dominate. For example, students tell stories on stage accompanied by polyrhythmic music (mirroring West African culture). This year, a student who was incarcerated for nine months told his story for the first time. Another young man who witnessed a murder in the streets of Boston also shared his story. Powerful stuff. What inspired you to become a teacher? The serendipitous circumstances of my becoming a teacher were quite dramatic. I spent the first half of my career in historical documentary film and I knew I wanted to make a career change, but I was totally lost as to what and felt aimless. I visited, in some desperation, a local career center and met with a counselor. She was retired, small in stature and had a face that was at once kind and wise. Her first words to me (not even a hello!) were, “You look like you’d make a really great teacher.” I was stunned. Instantly and almost instinctively this made perfect sense to me. I rushed home and discovered UMass Boston’s Teach Next Year program – and here I am ten years later. What is the best piece of professional advice that you've received? When I was an intern at the former Dorchester High School, the late Edward Noonan told me on our second and final meeting that when you’re really trying to get through to students, don't talk to kids here [pointing at his head], talk to kids here [pointing at his heart]. He was not referring to making a sappy, falsely sentimental speech, but rather show your students that you genuinely care. Don’t preach or make threats. Let your actions be your measure.